The neb rectangular table has a wide range of applications; dining table at home, a work tableat the office or a large conference table. The table comes in a number of variations, sizes, colors and materials to be able to fit its purpose in different settings. If you need to extend the table, placing a neb console table at the end is a quick and easy solution. When not in use, the console table can serve as small work place in another room. 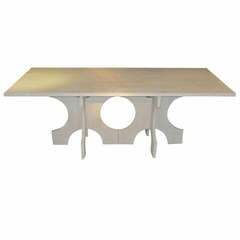 Table top materials: • White, grey or black laminate with a plywoodedge. Laminate is a strong and durable, water- and heat resistant material. • Oak veneer with a plywood edge painted black or coated with clear-, white or walnut colored wax. • Carrara marble, Verde Italia granite, Steel Gray granite, Grigio Carnico marble • Brass, zinc or copper on painted mdf. Steel tube cross legs •White, black, green or grey. Circular fittings • Black, white, grey or green. • Steel • Brass. Mix and match for your personal piece! Dimensions (cm) Length 180/200/220/240 (stone or solid oak can be longer) Depth 75/80/90/100/120 (stone or solid oak can be wider) Height 73 Other measurements, colours and materials upon request. In 2007, Per Söderberg felt that something was missing in his own home; a functional table for multiple uses. It needed to be a table for dinners with family and friends and of course a beautiful, personal piece of furniture. Per decided to approach the project with focus on the table base, aiming to design a sturdy table without the impracticability of one leg in each corner. Through experimenting with numerous prototypes, Per came up with the ingenious, elegant cross leg solution, providing excellent balance and natural grace. Second challenge: the fittings. The table should be hassle free to transport and assemble. The solution? A fully visible and decorative screw head fit- ting that has become a trademark for the New Early Birds range. Today, these two design elements can be found in almost all No Early Birds pieces, creating instant recognition and representing the simple philosophy behind the collection: “The design principles I developed for the first table where naturally applicable to other types of furniture, it was not planned that way, but it became apparent when I started experimenting with the cross leg and the circular fittings. This simplicity is not only a design issue, but it also enables an effective manufacturing process with few components and a few selected suppliers. That is something that the No Early Birds collection has in common with other iconic design classics that where designed during the post-war era and that are still produced today. Round Coffee Table in Carrara Marble, "No Early Birds"
Contemporary round extendable table in Biedermeier style made of cherrywood. Precious inlay on the top. The extension is stored inside. Measures when open: 160 x 120 x 78.